Women, words, and war — the art of dressing with military flare in WW1. An advertisement for corsets isn’t perhaps the most obvious place to find information on language change in a time of war. Nevertheless, in the Words in War-Time archive, history and history principles were regularly – and consciously – applied both to ephemera as well as a wide range of non-canonical sources. Source-selection – and historical evidence – could avoid the overly literary or poetical, focussing instead on resources which, even if closely embedded in the everyday, might, as Andrew Clark recognised in making these collections in 1914-19, all too easily be lost to ‘oblivion’ – with consequences for historians and historians alike. The military hat is especially suitable for morning wear, although its smartness makes it equally adaptable for dress occasions. A couple of rosettes are often rakishly poised at opposite ends of these close-fitting hats. One of the most notable of the military shapes is a striking reproduction of a field-marshal’s hat. It is carried out in soft pedal straw with the brim and crown faced with finest panne velvet, and is styled “Le General French”. 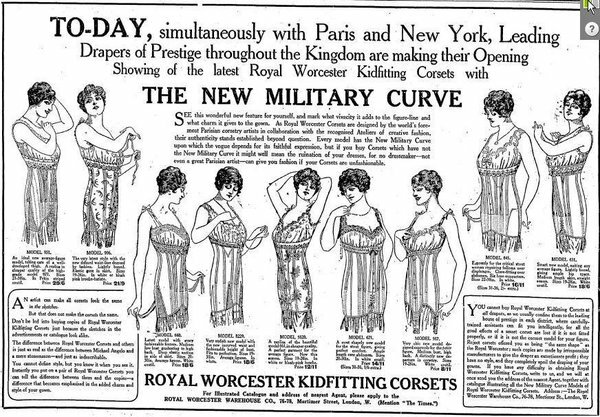 The military curve which appears in the advertisement above (as well as elsewhere in the archive) – in which military functions as a property of distinctly female underwear – offers further corroboration of this wider use.